Seattle’s been weird this week; wildfire smoke clogging the city, everything hazy and unclear. I just got back from a fun little mini-holiday, both here and in Montana, following Pearl Jam (my long-standing beloved and most favorite band ever) for a few shows. It was immensely fun, as it always is, but it also left me feeling a bit hazy and unclear – sleep-deprived, out of my usual care-taking role, a little off-kilter. So on return, the smoky city and I felt like we were well-matched. The smoke has moved out for now, but it’s hovering on the horizon, and we will likely be back in the thick of it next week. Summer is winding down, just a few more weeks before school starts and we fall back into our usual routines. I’m looking forward to it, in a way, as summer comes with a lot of pressure to be magic and carefree, when the reality is that applying sunscreen twice a day to two wriggling screaming children that do not want to have that sunscreen applied is pretty exhausting. We have had a very good time, but turns out that when you want to have a kitchen blog, it’s helpful to have at least a teensy bit of time to yourself as well as a teensy bit of motivation to cook. Summer saps me of any kitchen motivation; I never bake, I barely meal plan, all I want to eat is fresh farmers market tomatoes drizzled with olive oil. We’ve been on a minimally interesting meal rotation (pasta, burritos, some egg thing, repeat). We’re in our new, temporary housing while our house is being ripped up, so it still feels a little bit like we are on vacation. Any meal I actually make feels like a victory, but the actual cooking hasn’t been that much fun. BUT. We got apples in our Imperfect Produce box last week. I tell you what: booooooo. Our family’s fruit consumption is about to dive off a precipice, what with cherries, nectarines, peaches, plums, plumcots, apricots, apriums, and berries retreating in the lovely summer rearview. Dark days approaching (literally). So I realized a few days ago that I better start making the most of it. Not to say that eating a nectarine over the sink, juice running down my chin and forearms, isn’t making the most of it. But the nectarines aren’t as reliable as they were even a week ago. The juice isn’t running quite as freely. So it’s time to come up with a way to celebrate the last gasp of the glorious summer fruit. 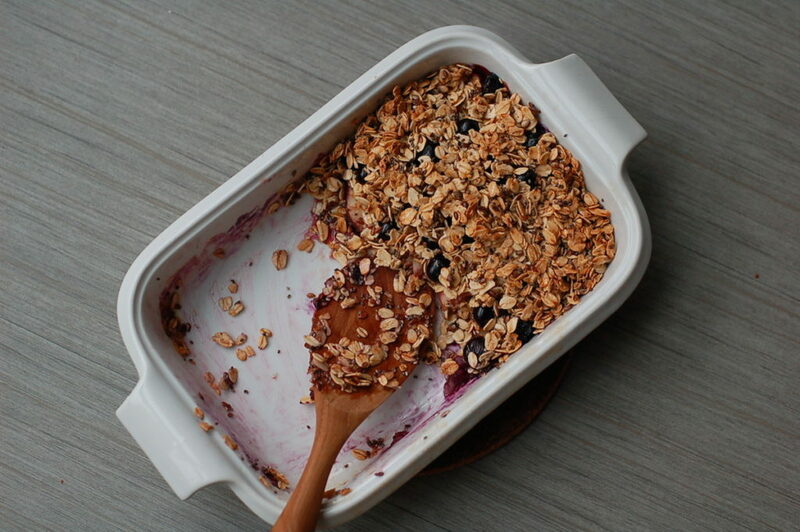 Behold: breakfast crumble. I’m forever serving my children balanced breakfasts and then watching them happily gobble only one side of the equation. This was the first breakfast I’ve made in a long time that they inhaled without complaint or picking. 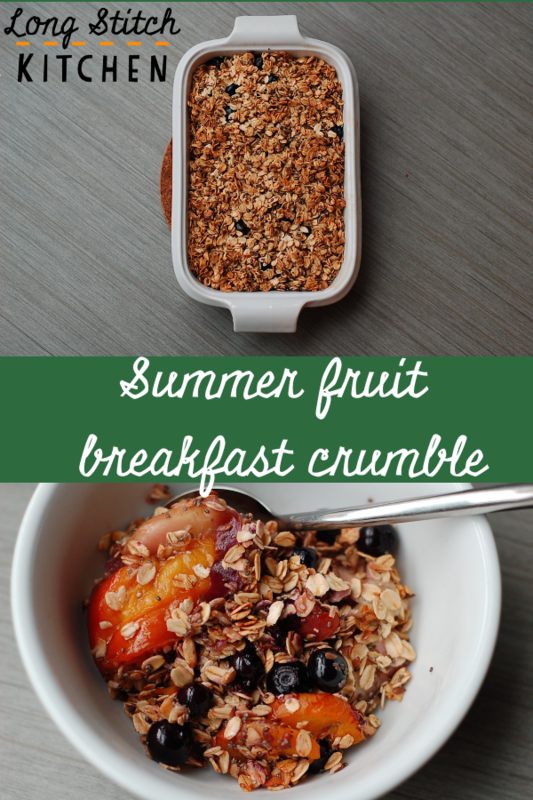 If you top this with a dollop of yogurt, you have a lovely, healthy, well-balanced breakfast that highlights beautiful summer fruits. Use non-dairy yogurt and sub in coconut oil for the butter, and it’s vegan. It’s gluten free, as long as you use gluten-free oats. It’s also very quick and easy – I make it in our toaster oven, so I don’t even have to heat up the kitchen. Gather your equipment and ingredients. I use a small, oven-safe casserole dish, about 8.5 inches by 6 inches. Put a generous pat of butter into the dish and put it into your oven. You want the butter to begin to melt while you prep your other ingredients, so use your judgment as to when to pop it in the oven. You want to take it out when the butter is soft enough to spread easily over the bottom of the pan, but before it burns. Get your oven, or toaster oven, preheating to 350°F/180°C. Wash and remove the pits from your stone fruit, then slice thinly. I think I got about 16 slices out of each fruit. Wash your berries. Is your butter mostly melted? Probably. Carefully remove your casserole dish from the oven and swirl the butter around so it coats the dish completely. Then, pour out the excess butter into a small bowl. 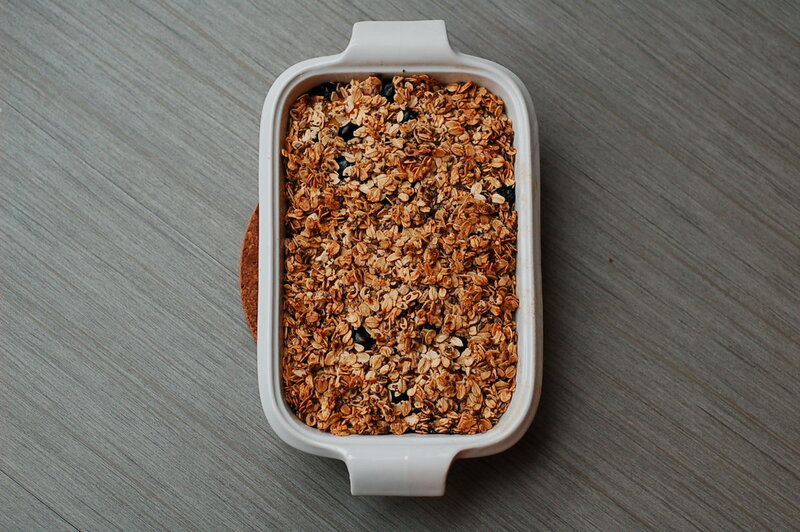 Add the oats, flax seed, chia seeds, salt, and maple syrup to the bowl with the excess butter. Mix thoroughly with a fork. Spread the sliced stone fruit into your buttered casserole dish. Toss in the handful of berries as well. 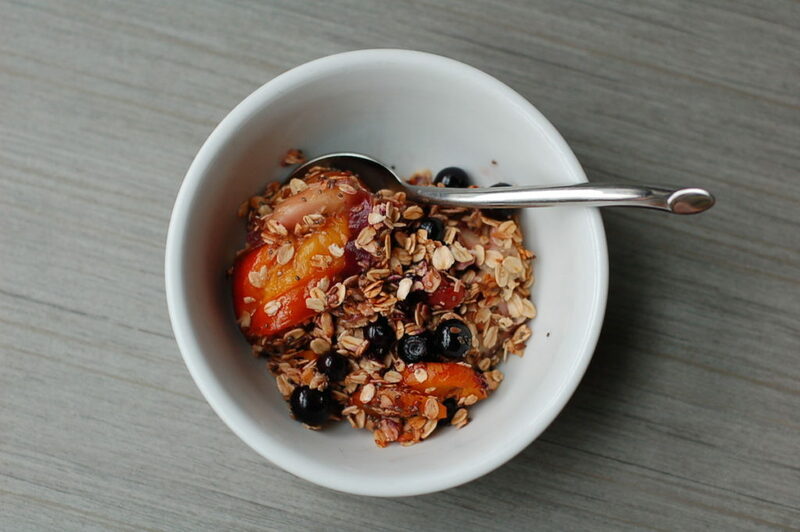 Spread the oat mixture on top of the fruit. Bake in your pre-heated oven for about 30 minutes. It should smell wonderful, be slightly browned, and the fruits should have begun releasing their beautiful juices. Allow to cool slightly, then serve. It's very good with a dollop of plain Greek yogurt. We've been all about the Fage full fat, if you can find it. How do you make sure to celebrate the end of the summer fruit season?